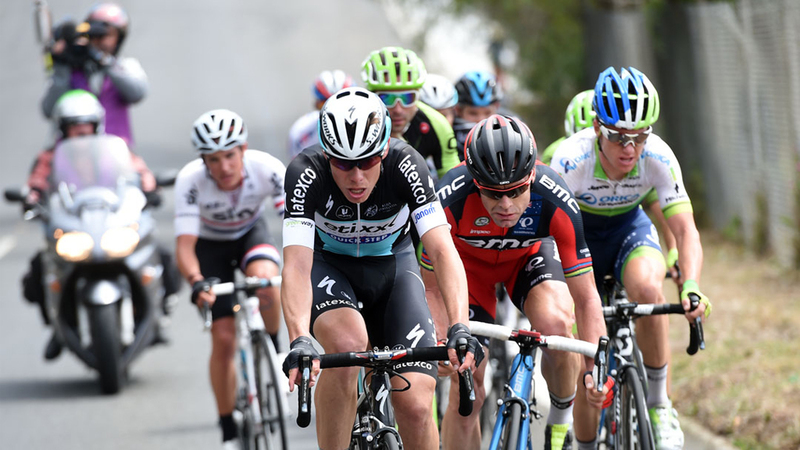 Get set for an action-packed weekend of cycling in Geelong and the Surf Coast. There are five official cheer-sites around the course where spectators can take advantage of the best viewing points during the race. Our spectator guide outlines where to find all of the amenities, big screen live coverage, entertainment, giveaways and more. Located at the start/finish precinct, the event village is where the build-up for Australia’s best modern-day classic begins. Here spectators will see the teams being introduced, the riders sign-on and finalise their preparations before taking on the spectacular course. Watch the action live on the big screen, participate in sponsor activities, enjoy the live entertainment, grab some food and beverages, then take a spot on the barriers for what is sure to be a blistering finale! Public transport is the best way to arrive at the Event Village. Take the train to Geelong Station and a 10-minute walk to the start/finish precinct. 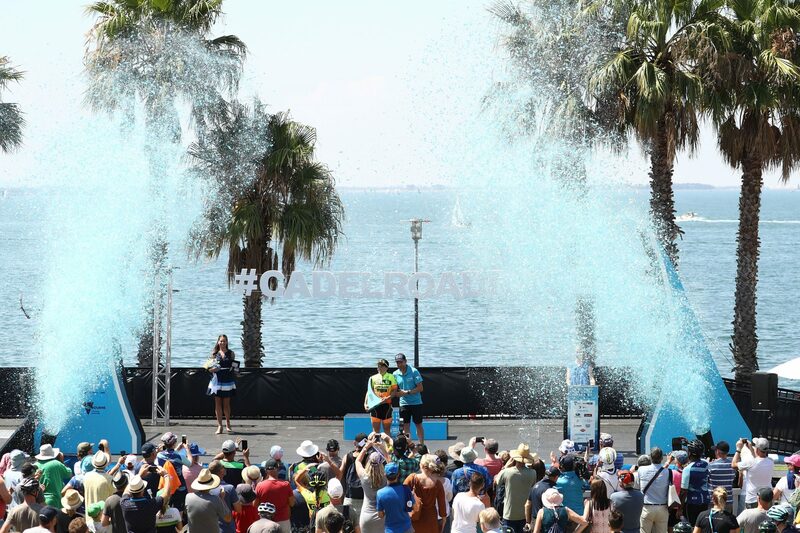 If driving, once in Geelong avoid Western Beach and Eastern Beach Road, as well as between Moorabool and Bellarine streets as there will be road closures. Instead, use Princes Highway, Latrobe Terrace, Mercer Street, Malop Street or Ryrie Street. The biggest crowds will gather here and so parking will be at a premium and affected by road closures for the event. Arrive early and be prepared for a short walk from your car and your parking spot, or from the train station. Please keep off the road and follow all traffic control, security and marshal directions as they are in place for yours and the riders’ safety. They will help you to get where you need to be as quickly and safely as possible. Please also avoid using graffiti on the road. Cheer on the Elite Women on Saturday and Elite Men on Sunday from this scenic and action-packed location. 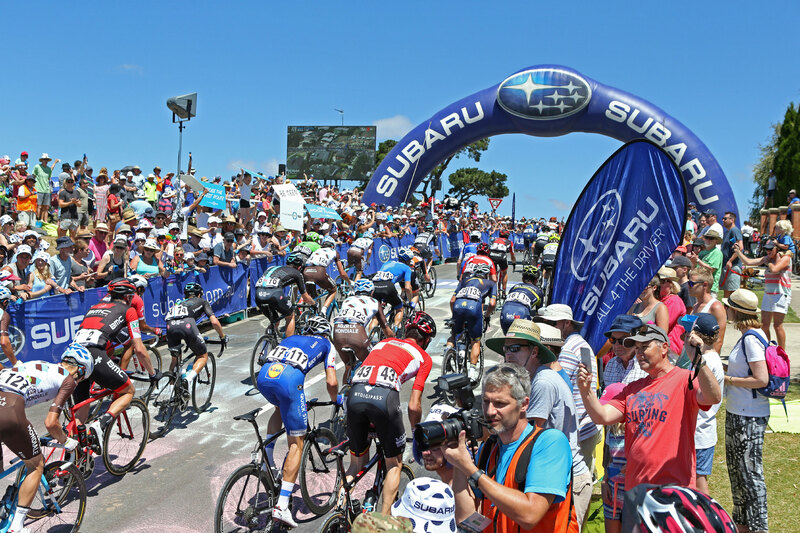 From here they can get up close to the riders as they take on the Bells Beach climb. Arrive before midday both days to avoid road closures. Please note, no amenities are provided at this location. Take the Great Ocean Road and turn onto Addiscott Road, follow to the T-intersection of Jarosite Road where the KOM is only 700 metres away. Alternatively, use Addiscott Road and turn down Bones Road which becomes Bells Beach Road. Park on Addiscott Road and walk down Jarosite Road towards the beach (700 metres) to where the KOM takes place. Alternatively, you can park at any of the Bells Beach Road car parks and either ride or walk two kilometres to the top of the KOM. 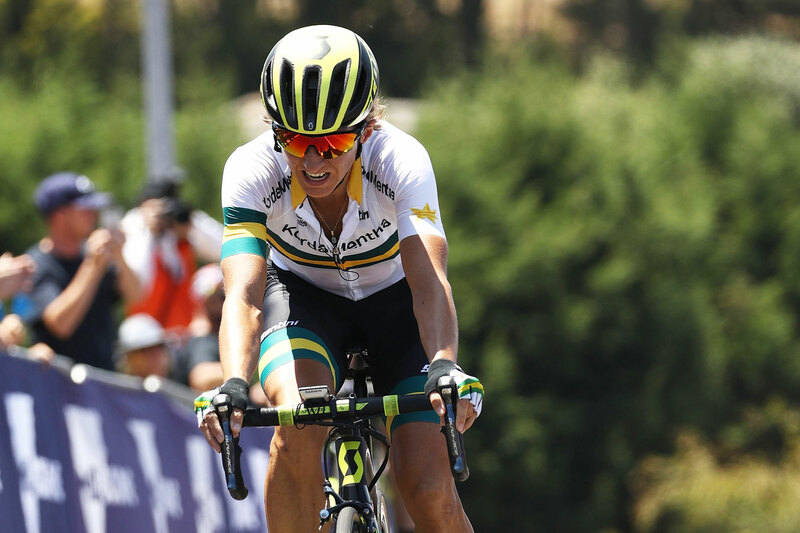 See the agony on the faces of the world’s best cyclists as they take on the steep Challambra climb, made famous by the 2010 UCI Road Cycling World Championships. The Elite Men tackle this climb four times, while the Elite Women race over Challambra Climb after they come into Geelong and on their way to the waterfront. The live site is open from 11am – 4:00pm on Sunday only. Arrive early to beat the crowds and traffic management treatments. If coming from Melbourne or the Surf Coast use the Princes Freeway and either take the Barrabool Road off ramp* or Princes Highway off ramp and come up via South Valley Road. If coming from Central Geelong, why not ride your bike. *This is part of the course so please arrive early. The closest off-street parking is Barrabool Hills Plaza or Highton Village. There is limited on-street parking, but we ask that you are respectful when parking on the street in front of residential properties. Mt Pleasant Road is a good option with a walk from here. Please don’t park on the course. Here one can see fast and furious racing as the riders battle it out for the Torquay intermediate sprint points. Take advantage of the nearby amentieis including local cafes, shops, public toilets and why not cool off at the beach afterwards! 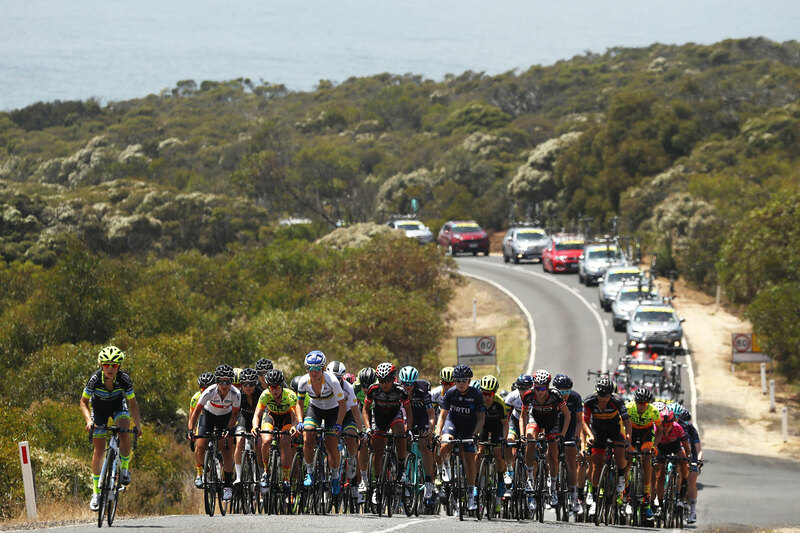 Big crowds will gather in Barwon Heads, the hometown of Cadel Evans, where the peloton flies down the main street. Look out for teams trying hard to establish a breakaway in the race before the course changes direction and hugs the coast at Thirteenth Beach. For the Elite Women, the first Mapei Sprint Points are up for grabs. Enjoy a bite to eat in the area, visit shops or hit the recreational riding trails while in town. Swisse People’s Ride participants are sure to pack the cafes and restaurants here on the first official rest stop. Access via Barwon Heads road if you are early because it is part of the course. Arrive via Ocean Grove if you are running late. Try Flinders Parade, Bridge Road near the IGA. Avoid parking on Hitchcock Avenue, Bridge Road and Ewing Blyth Drive as it’s part of the course. Download our Riders list for handy reference on race day.